Well, it’s time to get that board out and ready for early season, people dodging, snow ribbon riding. 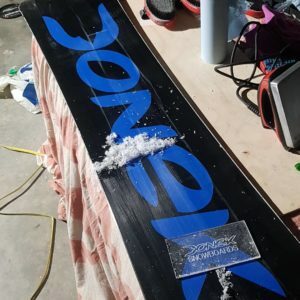 There’s a good chance that you didn’t clean your board from the late spring season and that means your base is slow. One of the best ways to prepare your board is to give it a good base clean. There are several methods and chemicals for this and today we are going to talk about our favourite and simplest way to get your base shiny and fast again. Base Cleanser – This usually is the harshest part in terms of chemicals for you and your base. There are many products out there, Donek uses Wend products like the MF natural cleaner for $16 as it is gentle on you and your base compared to other products. You can even use dish soap or a vinegar solution if you rinse the base well. If you do use popular cleaners like a Swix wax brand be sure to use gloves when applying it to the base. You need something to get the grime off is the idea and make sure it is dried with a towel or cloth. Hot Wax – Wax the board in straight lines moving from tip to tail using a soft, oily, non fluorinated wax. Make several passes to soak in the wax making sure the iron is always moving. This will pull all the small particles from the base, especially if your board is made of sintered material. Hot Scrape – Right after you finish your passes with the iron get a sharp scraper ready to scrape off the wax in straight passes preferably moving from tip to tail of the board. Have a plastic Scotch scourer pad ready to buff out the base at the end to make it shiny and fast. Having your base clean and ready to rock means that when the snow is ready you are too and but your friends may have to catch up.